The Independent National Electoral Commission has spelled out the voting procedures for the 2109 General Elections . The election umpire wrote via its verified Twitter handle , @inecnigeria. Upon arrival at the polling unit , joins the queue and present yourself to the INEC official ( APO 111 ) at the polling unit who will determine whether you are at the correct polling unit and check if the photograph on the Permanent Voter Card ( PVC) matches your face. If satisfied , he/ she will direct you to the next INEC official ( APO 1 ). The official ( APO 1) will request for your PVC to confirm that your card is genuine and your details, using the smart card reader . He / she will ask you to place your finger on the card reader to confirm that the PVC belongs to you by ascertaining, the card reader will contains the name , photograph and finger prints of all those registered in their polling unit. You will then meet the next official ( APO 11 ) who will request for your PVC to confirm that your name and details are in the voters register . Your name will be ticked and your PVC returned to you. He / she will then apply indelible ink to the cuticle of your appropriate finger for that election to show you have been accredited to vote. ( If your name is not found on the register, you will not be allowed to vote) . The presiding officer ( PO ) stamps , signs and endorses the date at the back of the Ballot Paper . The PO will roll the ballot paper inwardly with the printed side inwards and give to you. He / she will then direct you to the voting cubicle where you vote in secret . 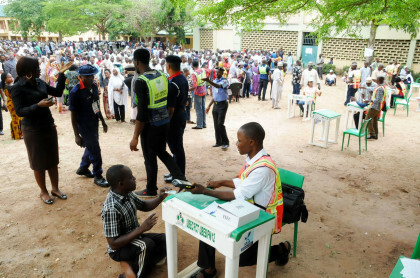 You will then leave the polling unit or wait if you so choose in an orderly and peaceful manner to work the process up to declaration of result . The result of each polling unit shall be pasted at the unit and for everyone to see.